I've just realised this is the third book I've read in about a month that was recommended by a guest on BBC Radio 4's A Good Read - this time by journalist Sali Hughes, whose own books, Pretty Honest and Pretty Iconic, I have previously reviewed. 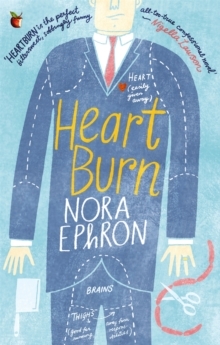 Heartburn is a short novel by the late Nora Ephron and is essentially a fictionalised account of the breakdown of her second marriage after her husband's infidelity. It's hard to say whether I would have enjoyed this book as much had I not known that in reality the husband was Watergate journalist Carl Bernstein and his mistress was Margaret Jay, daughter of Prime Minister James Callaghan and wife of the British ambassador to the United States, who then went on to return to the UK and become a politician; I suspect probably not if I'm being entirely honest. Anyway: in Heartburn, screenwriter Ephron becomes food writer Rachel, Carl becomes Mark and Margaret becomes Thelma, but it's impossible not to picture them as the people they really are and and I'm sure this must have been Ephron's intention. A marriage breakdown is an inevitably sad thing and Ephron doesn't shy away from this at all. Rachel loves Mark very much, they have a small child together and Rachel is pregnant with their second when she finds out about Mark's affair; there is no sense in which the end of their marriage cannot be sad. And yet Heartburn is for the most part very funny. It's witty, perceptive, self-deprecating and honest and although I'm fairly sure every single character would drive me utterly insane if I met them in real life - literally everyone is a wealthy, incredibly neurotic, self-obsessed gossip - I did enjoy reading about them and there are plenty of observations that apply even to those of who don't treat therapy like going for a massage and have ongoing battles over multiple property renovations. Moreover, Ephron, through Rachel, is fully aware of the ridiculous foibles and clichés of Washington DC's well-off middle-class social set and happily draws attention to these absurdities, including her own, which makes for highly entertaining reading. Most appealing of all is Rachel's firm commitment to getting on with life: however devastated she is by Mark's betrayal with a woman with a "a neck as long as an arm and a nose as long as a thumb", she realises at the end of the book that she can't stand feeling sorry for herself and she can't stand other people feeling sorry for her. "If I tell the story," she says, "I can make you laugh, and I would rather have you laugh at me than feel sorry for me." Interspersed throughout the novel are simple recipes, including one for a vinaigrette Rachel not unreasonably can't believe Mark will be able to live without and a key lime pie that she eventually throws at him at a tedious dinner party when the penny finally drops that she can't make him love her again. I'm not entirely sure whether the recipes and the food references really sit well within the narrative, and I'm sure some people will find it jarring, but as someone who loves food and is particularly fascinated by middle-class dinner party food of the 70s and 80s, I personally greatly enjoyed them (quite tempted to make the key lime pie although I shan't be throwing mine at anyone). There's not a single poorly-chosen or superfluous word in this book. It's a short read, and I don't think it would be anywhere near as good if it was a single page longer - just like a key ingredient in one of Rachel's meticulously proportioned recipes, if there was any more it would be too much.